UNCG alumnus Paul Chelimo '14 celebrates after finishing third at the U.S. Olympic track and field trials in Eugene, Oregon, on July 9. Thirteen minutes and 35 seconds. That’s how long it took former UNCG track and field star Paul Chelimo ’14 to punch his ticket to Rio. But for the Olympian – who will compete in the first round of the men’s 5,000 meter race on Wednesday, Aug. 17 – the journey has been anything but fast. A native of Kenya, Chelimo discovered his speed as a young boy playing tag with his brothers. In middle and high school, Chelimo participated in track and field meets. But it wasn’t until November of 2009, one month after he graduated from high school, that he bought his first pair of running shoes and started training competitively. Just one year later, Chelimo moved to the United States to attend Shorter University in Georgia. In 2011, he transferred to UNCG. His career at UNCG – which included outdoor track, indoor track and cross country – was decorated, to say the least. In 2012 and 2013, Chelimo was the national runner-up in the 5,000 meter race at the NCAA Outdoor Track and Field Championships, posting times of 13:41.04 and 13:40.41, respectively. He was also a three-time Southern Conference Cross Country Champion and a six-time All-America recipient during his career. Chelimo’s work ethic and competitive spirit extended from the track to the classroom. The public health major was a recipient of the Irwin Belk Athletic Scholarship and the Aaron Bobb Scholarship and graduated with a 3.6 grade point average. 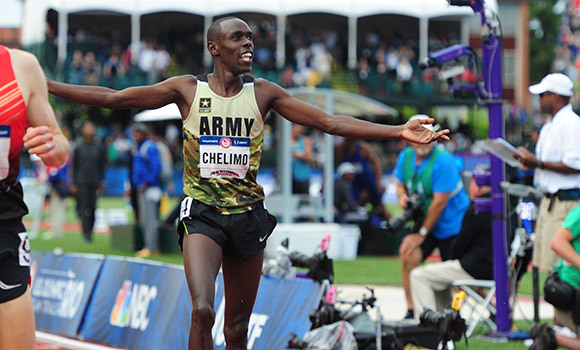 Upon graduation, Chelimo was accepted into the highly competitive U.S. Army World Class Athlete Program, a unique opportunity that provides outstanding soldier-athletes the support and training to compete in national and international competitions while maintaining a professional military career. For Chelimo, who became a naturalized U.S. citizen through the military program, his service as a water treatment specialist in the Army is inspired by his gratitude for the opportunities he has been given. It’s been a long journey for an athlete accustomed to speed, but it’s safe to say that Chelimo’s training has finally paid off. As he prepares for the most important race of his life on the world’s biggest stage, Chelimo is quick to thank UNCG and the Greensboro community. And there’s no question that the campus community is behind him. Share your Spartan pride and wish Paul good luck on social media using the hashtag #ChelimoInRio.